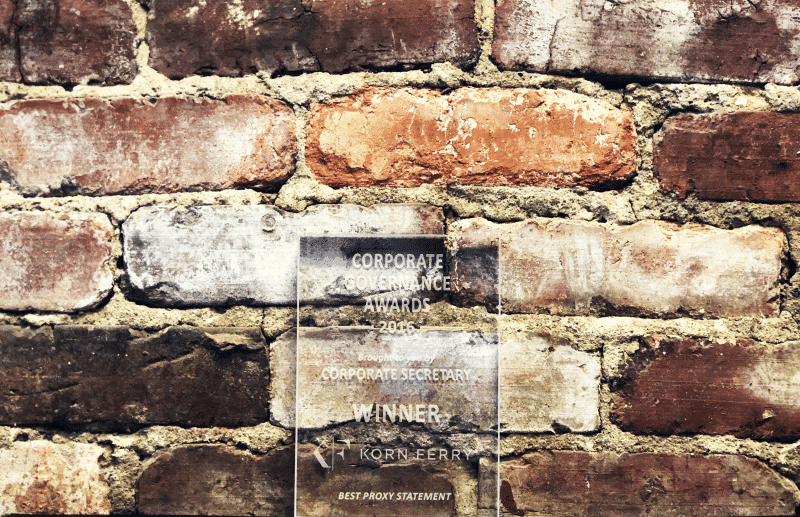 Following its decision to redesign its proxy to better communicate with stakeholders, Korn Ferry was recognized with a 2016 Corporate Governance Award for best proxy statement. We talked with General Counsel and Managing Director for Business Affairs Jonathan Kuai about the experience. What benefits did the award bring to your team and to Korn Ferry? First, there was the recognition of a lot of effort by a lot of different people, including our board, our internal teams and our external partners. It also provided external validation that we were committed to enhanced shareholder communications, including 10Ks, quarterly earnings releases and calls and our proxy. And, it’s always nice to win an award! Why was improving your proxy important to you? It’s a tone that’s set at the top. Our senior management and the board wanted to ensure that our shareholder communications are clear, concise and talk about issues important to existing and potential shareholders. It begins with a determination to be best in class. Some companies wonder if it’s worth the effort to review how they’re disclosing their information; how do you see it? It’s true that it takes time and effort. For us, it was worth it both to enhance our shareholder communications and to show that we consider it a priority. A nice bonus was the positive feedback about the proxy that we received from our own employees who said that they felt like they were getting a behind-the-scenes look into how the board views certain topics. Who was involved in this process? It was a true collective effort involving our CEO and CFO and our HR and marketing teams. We also had strong support and participation from our board members and some really valuable insights into our governance. And, of course, there were our amazing external advisors! Can you talk about how you approached the process and what, if anything, you would do differently? One of our first steps was hiring a design firm – you guys. But, it really begins with making the decision that you want to do something better and figuring out what it is that you want to say. From a tactical standpoint, adding an executive summary is a useful step, if you don’t already have one. In terms of what I’d do differently, understanding now that it takes a lot of thought, I’d definitely start earlier. What’s next for you to improve further? While we have reached a certain maturity in our proxy, we need to continue innovate and make sure we’re talking with our shareholders about the issues that really matter most to them. If you had a magic wand, what would your dream proxy look like? I am a very proud father of two young kids and I can’t help thinking that making our proxy into a pop-up book would be nice so I can more easily share my work with them…and maybe some chocolate!